URI Rams live here Sept 2019! Avail 2019 grad wknd! Book summer weeks now! Eastward Look, southside. Easy and convenient access to best destinations in South County. Four bedrooms available May 2019! Ideal for couples, singles, families, school visits, family escape, weddings, high school reunions, etc. - great restaurants, especially for lobster, clam cakes and chowder! Cottage is a private getaway where you'll feel right at home! The home is professionally styled with updated furnishings, accessories, appliances and electronics. Furnished screened porch is perfect for keeping cool on a hot, sunny day or relaxing on a rainy one. Large landscaped yard and private deck will provide space for hours of relaxation and playtime with your family. Resident and guest access to neighborhood association tennis courts, basketball court and playground. You'll hear the ocean and smell the sweet, salt air from this inviting and spacious beach cottage. You'll really enjoy this seaside retreat any season! Property owner and manager. Interior designer. Mom of boys. 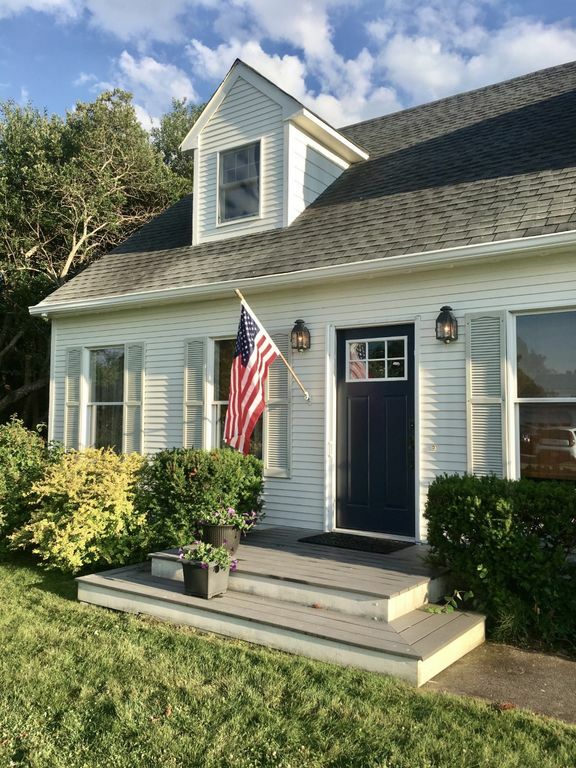 Large professionally decorated living spaces, lovely screened porch, private deck and yard, spa-like private shower and cabana, beautiful perennials, spacious yard for outdoor games and horseplay, ideal location to beaches, shopping, restaurants, Block Island ferry. LG washer/dryer is included in first floor bathroom with tiled shower. Second floor has full bath/shower, pedestal sink and linen closet. You'll love the outdoor shower -- a private mahogany and cedar enclosed shower and changing cabana off private backyard deck. Weekly landscaper included in lease. Perennials gardens throughout yard. Your family will enjoy this part-time-owner-occupied, spacious, charming beach cottage. You can hear the ocean waves and smell the salty air from the screened porch and private backyard deck. Cook (if you want) in a renovated kitchen with stainless steel-finish appliances.Beach cottage located on a quiet street. It's surrounded by a large flat yard that provides plenty of space for many family summer activities, like wiffle ball, soccer, bocce, badminton, etc. Yard is fenced on three sides with wooded lot on left of house, structured fence on other two. Ideal location for walking to beach, bike riding and roller-blading inside the neighborhood. Tennis courts, basketball courts and children's playground are available to all Eastward Look residents and guests/renters. This stay was fantastic! The house was clean, and incredibly decorated. Karen was very easy to contact and very kind to work with. We had the best trip, and hope to come back soon! Thanks for your review. You were all great guests. The house was very well cared for during your stay and I greatly appreciate it. I hope you'll return very soon! I have been for moms weekends and family time. Spacious but so cozy. Backyard is a lovely oasis. Outdoor shower is awesome! We have never been disappointed when renting this property. We book early and often and treat this home as if it were our own. The owner takes great pride in providing all the amenities of a " real home" . The furnishings, the linens, the well appointed kitchen, and manicured yard all add up to an enjoyable and relaxing stay. There is plenty of room and privacy to accommodate a large family or four couples quite comfortably. In our opinion this home is an ideal choice for someone looking for a cut above the usual beach properties. Salt air breezes with all the comforts of home! This was my family's fourteenth summer vacationing in this beautiful seaside home. Through the years, the owner has updated and maintained the property amazingly well. Each year, we are more than pleasantly surprised to find what is new and/or different in the home. It is obvious everything is done to ensure the guests are comfortable and have everything needed for a relaxing and enjoyable vacation. The four bedrooms are clean, spacious, and bright and have the most comfortable beds! The kitchen has everything you need for cooking and preparing and opens to a spacious living room on one side and a huge screened porch on the other. This is my favorite spot! It is furnished and decorated in such a way that I get the feeling of never wanting to leave! The porch is attached to a deck which leads to an outdoor shower area and gorgeous new shady backyard retreat, where you can relax on the hammock and catch up on summer reading. The yard is big enough for our family wiffle ball games and there is plenty of off-street parking for our guests. We enjoy walking to Scarborough Beach, but if you choose to drive, the options are endless. Our children enjoy mini golf, go-karts, and batting cages which are just a short drive down the road, and I enjoy the shopping options within five to ten minutes of this home. It is only a few minutes drive to the Block Island Ferry in Galilee, where you can also get fresh seafood. There is something for everyone in beautiful Narragansett...We are already looking forward to going back to this home next year! This was a wonderfully versatile rental: large enough to accommodate overnight guests, small enough to feel comfortable for our family - and priced well for both purposes. The owners were really solicitous and responsive. The house was clean upon arrival with all the cleaning products you might need for a week to manage your upkeep. What stood out about this rental was how new everything felt, especially the furnishing touches of wall hangings etc. This seems minor, but it made the house feel fresh and modern; it is not a repository for everything the owner doesn't want in her own house. We felt like we were living in a real house with a casual decor - the perfect balance that allowed us to settle in and enjoy. There were A/Cs in 3 of 4 BRs and plenty of fans - but we never needed them, since the temps inside remained cool and comfortable all day. Another unsung feature: fantastic water pressure in all showers, including the outdoor shower, which has a spa-quality environment. Each time you return from the beach, you feel like you're getting a little pampered using the outdoor shower. The owner also under-sells the backyard, which is the most private (ie. keeps the kids contained!) in the neighborhood, with a lovely hammock, beach toys for kids, and a great deck off a great screened-in porch. It was also a quiet rental neighborhood. I think this rental must be just about the most bang for the buck you're going to get in the South Scarborough neighborhood. It's only drawback is that it is enough of a walk to the beach (you walk to a section of this development, along a walkway, then down the street leading to the beach) that you will want to use the wagon provided and set your expectations accordingly - you're likely not popping down to the beach and running home because you forgot sunscreen (although you could). If you have a slew of young kids, you would do just as well to load up a group in the car and drop them off, then return the car. But I've done this on previous Narragansett rentals and it's feasible. I highly recommend this rental. We loved it. The property pics are somewhat different than the real thing, some things were slightly not what we expected. In the pics it shows an extra table in the kitchen area, but in the house it's now located out on the porch, so it was hard to eat together as a family of 5. The iron bed is not there etc...The house was left neat, but not clean. It looked as if it had not been vacuumed or dusted in a while so we were kind of disappointed. The house has some things that need maintaining...tiles in downstairs bathroom falling apart, downstairs toilet is loose, walls need painting and lights flicker in kitchen which got really annoying. The bedrooms were spacious and had plenty of room. The house had games and a few small kids toys. It had everything we needed for cooking, laundry and bedding. The porch was nice and the house had a wonderful breeze for the most part so no AC's needed except one day. The yard was spacious and the outdoor shower was great and helpful for the days at the beach. We loved the fire pit and hanging on the hammock as well. The tanks left for the grill were almost empty and we were told they would be filled but we managed. The walk to the beach does have a path which the owner said they would draw a map to, but never did. We went walking and asked around and found it ourselves. It is misleading and takes 15 minutes without children to walk to the beach so with little ones, it might be hard. The owner was hard to get a hold of and doesn't respond to emails quickly and her voice mail box was full. Overall, we liked our stay but felt a little let down. We had a great time regardless and still think it's a great house. Just needs some updated pics and some repairs and a little follow through from the owner on things promised/mentioned. We always do our very best to address and respond to what tenants report as disappointing and/or annoying. This review is the first opportunity we heard about these issues, so we didn't have the chance to address these issues with the tenants during their stay. If you choose to rent our summer home, please know that we will do our best to address any issues/problems you have, as long as you inform us of the issues at your arrival or during the first few days of your stay. Because of this review, the cleaning company used for the July stay was dismissed and won't be used again (thank you, reviewers!). Also, we added a new Dyson vacuum cleaner for the use by all tenants to combat dust and beach sand. Other annoyances have been or will be addressed to the best of our ability during the next few weeks. We hope you enjoy the new photos and look forward to working with all future and returning summer tenants. Beach house is located within 10 minutes of the Block Island ferry, restaurants, shopping, deep sea fishing charters or day sailing. Historic Newport and Watch Hill are 25 minutes by car. In Galilee, which is a five minute drive from the cottage, you can buy fresh lobsters from the area's fishermen! Adventureland, which includes go-karts, bumper boats, mini-golf and batting cages, is two miles from the house. Movie theaters, a bowling alley, museums and indoor roller skating are within 10 minutes for those occasional rainy days. The cottage is 1/2 mile from Scarborough State Beach, accessible via a walking path. Less than two miles away is Roger Wheeler State Beach (also known as Sand Hill Cove) where the waves are gentle for smaller children and has a playground on the beach and nature/craft/story hour -- available to all beach patrons. Narragansett Town Beach, a five minute drive, is the place you can watch/join the surfers and enjoy the Narragansett Pier area.